This one really interests me as I've never read about Elizabeth, Queen of Bohemia and daughter to King James I of England. But, I've never read anything from Christie Dickason...have you and what did you think? 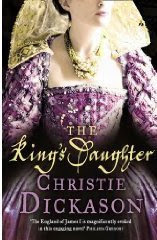 Superb historical novel of the Jacobean court, in which Princess Elizabeth strives to avoid becoming her father's pawn in the royal marriage market The court of James I is a volatile place, with factions led by warring cousins Robert Cecil and Francis Bacon. Europe is seething with conflict between Protestants and Catholics. James sees himself as a grand peacemaker -- and what better way to make his mark than to use his children in marriage negotiations? Into this court come Henry, Prince of Wales, and his sister Elizabeth. Their louche father is so distrusted that soon they are far more popular than he is: an impossibly dangerous position. Then Elizabeth is introduced to Frederick of Bohemia, Elector Palatine. He's shy but they understand one another. She decides he will be her husband -- but her parents change their minds. Brutally denied Henry's support, how can Elizabeth forge her own future? At once a love story, a tale of international politics and a tremendous evocation of England at a time of great change, this is a landmark novel to thrill all lovers of fine historical fiction. This is outside my normal interest, but the cover is really pretty! Looks interesting! I haven't read her other novels, but I probably will search out this one. I havent read about Elizabeth either, but this one does sound very good. I definitely want to read this. I am working my way through Jean Plaidy's Georgian saga. The Georgian monarchs were Elizabeth's descendants - her marriage to Frederick of Bohemia was what eventually gave the British crown to Germans! I recently read "The Firemaster's Mistress by Christie Dickason and really enjoyed it. She's done quite a bit of research about the Jacobean age, and I liked the love story as well, so I'd guess this one will also be good read. I enjoyed The Firemaster's Mistress and the sequel, and enjoyed them, so I will definitely be giving this one a go. Topic and author are new to me -- but I'm adding it to the list! I read THE FIREMASTER'S MISTRESS and THE PRINCIPESSA and really enjoyed them (much more than I thought I would) so I'll definitely read this one. I said this already on your Facebook, but thought I'd mention it here for others... Jean Plaidy's The Murder in the Tower is set in James I's court and has a bit about the young Princess Elizabeth.